Apple Just Quietly Released New AirPods. Here's What's New. AirPods have come a long way. At first, there was nothing dorkier than having floating, easily losable nubs in your ears. Now, if the teens are to be believed, you're essentially wearing a sign that says 'I'm a broke loser' if you have a single wire on your person. But the new AirPods are here, and we can only assume a new generation of wealth-based shaming is coming with them. The big changes for the new model are a new chip, improved battery life with 50% more talk time, the ability to trigger your virtual assistant by just saying, "Hey, Siri," and a new wireless charging case. That new chip is the H1 (the old version is the W1) and brings with it an extra hour of talk time, increased mic clarity, and twice-as-fast connection times when switching devices. And the new 'Pods support Bluetooth 5. If you're worried about getting shamed because you don't have the new model, don't: they look almost exactly the same, and you can just lie about having the new ones. The only visual change is that the wireless charging case has an LED indicator of battery life on the side. 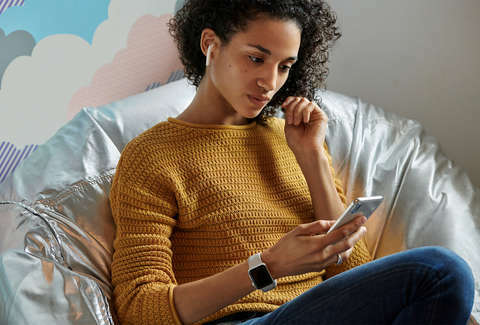 You can purchase the new AirPods in two versions: with the wireless charging case for $199, or with the previous generation's case for $159 -- the same price as the original AirPods. If you don't want to upgrade, but do want that new case, you can buy it separately for $79. We can only hope that the third generation will feature some technology that prevents you from losing your headphones. Like a wire that connects them to your phone, or something.